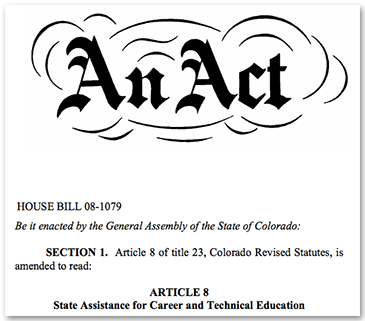 The Career and Technical Act, formerly the Colorado Vocational Act of 1970, CRS 23-8-101, was adopted by the Colorado General Assembly to provide assistance to local school districts operating CTE programs approved by the State Board for Community Colleges and Occupational Education. Currently, there are 180 secondary school districts that are eligible to participate in the Career and Technical Act program. The process and disbursement of CTA funds are governed by the SBCCOE Rules and Regulations. Funds are dispersed to eligible districts as a reimbursement based on the previous year’s final financial report submitted to CCCS by each district on September 1st.